Sir - we have a well water that is very high in minerals. Our test results show 1.8 mg/l Iron, .12 mg/l manganese, 1020 mg/l chloride, 1600 mg/l sulfate, 640 mg/l sodium, 3800 mg/l TDS, and 1800 mg/l hardness. pH is 7.0. No odors except for a rusty smell. Home is on septic system and I am concerned the RO waste water will flood the septic system. Are there any alternatives to RO for our water? Sorry to report, there is no good alternative to whole house reverse osmosis. However, the system can be designed to minimize the amount of waste water generated. It can be recycled to a certain extent. Often a separate leach line will be dug, to percolate the water back into the earth. Up to 75% of the water can be recovered as great quality water. So for example if you use 150 gallons of water per day, you might have 50 gallons of waste water. A whole house water treatment system using reverse osmosis ("RO") will remove the high levels of minerals and salts from your well water. The result is clean water throughout the house. Because of the high levels of iron, a MangOX iron filter is used first, to pre-filter the water and remove iron and manganese. To prolong the life of the RO membranes, and minimize waste water, a special type of pre-treatment system is used. Unlike many whole house RO systems, this system does not require a water softener. No water softener is needed and no additional salt water waste is generated. A non-toxic anti-scalant is injected into the water ahead of the RO system. This is used instead of a softener and injected by way of a metering pump into the water before the EPRO to prevent scale build-up and premature fouling of your membranes due to your extremely high hardness. After the RO system the purified water is filtered through a calcite neutralizer, which adds some pure calcium and magnesium into the water. The pH balanced purified water is then stored in a storage tank. After the storage tank, a booster pump gives excellent water pressure to the home. Excellent warranty: 10 years on the catalox media tank; 5 years on the control valve. Pump output 0.5 to 10.0 gallons per day (1.9 to 37.9 liters per day); voltage 115 or 220V; 60 Hz. 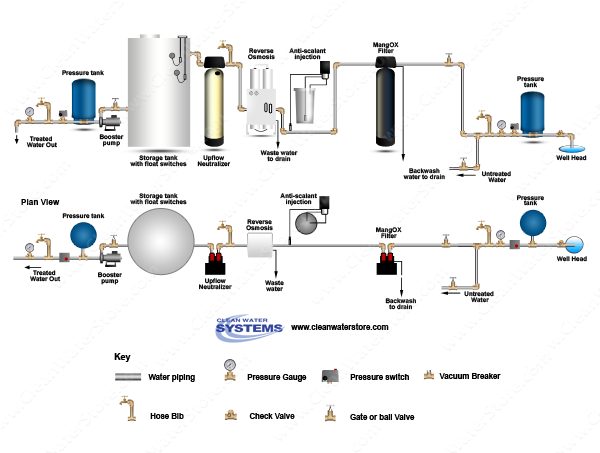 This is a complete system that comes with everything you need: solution tank; metering pump; tubing; fittings; and injection check valve. RO Pretreat Solution Antiscalant PreTreat Plus 1100 5 Gallon. NSF certified for use in drinking water. Used in commercial and high flow reverse osmosis systems to prevent scale build-up and fouling of the RO membranes. Neutralizer 7000-SXT Calcite uses the higher quality, more expensive Enpress tank with Vortech distributor which allows the neutralizer media to be backwashed at lower flow rates with less water, saving water and energy. Eliminates acidity in the pH range of 6.0 to 6.9 by slowly dissolving Calcite (calcium carbonate) into the water as it flows through the filter. 3000 Gallons Per Day 2.0 gallons per minute 11.4 cubic meters per day. Heavy-Duty Commercial Reverse Osmosis System: produces high quality purified water by reverse osmosis thin film (TFC) membrane using a high pressure pump (included).